My first Tae Bo experience was in high school. My dreamy boyfriend’s mom let me “borrow” her freshly ordered-from-TV advanced Tae Bo VHS tape. I’m sure by lending it to me she expected to get it back, but I just checked and it’s still in my basement. Ahem, 12 years later. Whoops. Forgive me, Mrs. Davis? Remembering that stellar workout, I recently rekindled my relationship with Billy. After those 12 long years I have to report that BILLY LOOKS EXACTLY THE SAME. It’s amazing. His hair is the same, his clothes are the same, and the set design and music are still the same. In fact, his workout posse pretty much looks the same, too, minus a couple of fitness-model blondes who have been traded out for normal-looking brunettes. The DVD name is quite the mouthful and punctuation tutorial on colons, Billy Blanks:Tae Bo: Amped Fat Burn Accelerator. I guess when you have a fitness empire with loads of DVDs in your name, you have to get creative with the titles. The DVD is about 50 minutes long and features mostly cardio moves with a few strength moves such as squats and tricep kickbacks using the “amplifier.” The amplifier is basically a glorified stick that extends. Unfortunately, the addition of this stick, or schtick if you will, is the only “new” addition to Billy’s moves. Despite being a spiced-up repeat of the punch-and-kick combos from my stolen 1998 tape, the DVD is a good workout, and it got me and Billy sweating. (Boy, does Mr. Blanks sweat.) However, there’s a lot of counting to eight followed by, “Now everybody jam!” or “Get amped!” When Billy says that,everybody speeds up their movesto a psycho speed that makes it impossible to have correct form. Back in the day he called this “double time,” but I think he’s taken the speed to quadruple heights. And one of the girls is constantly screaming at Billy “yes, sir!” which is just weird. I’m for enthusiasm and all, but girlfriend is a bit too intense for me. Want more reviews? Read the Fit Bottomed Girls’ new release reviews and retro reviews. For more on how our ratings are determined (it’s not a science, but we do have some method to our madness), read our review criteria. Photo grabbed from www.photobucket.com; http://static.squidoo.com/. I Billy Blanks!! Reminds me of when I had my first apartment and my roommate would attempt to do it with me. I could totally kick her trash at that video (meaning I could walk away a litte sore after doing my best while she’d be passed out for a few hours on the floor). Thanks for the review! I was thinking of Netflixing this, but wasn’t sure it would work without the new “shtick.” Would my resistance band work? tfh: Nah, I don’t think it would unfortunately. Actually, most of the moves are fine without weights, and you could easily sub a three- or five-pound dumbbell for the strength moves. If you try it, let me know how it goes! I had no idea he was still around! Thought he got lost in infomercial land….May have to give it a try. Billy looks like Yurtle the Turtle. man do you REMEMBER when he was all the rage?! I may need to check this out for the very reason. missicat: First of all, your blogger icon with the cat in the scarf is hilarious. It made me giggle with delight. Second, he may still be in infomercial land, but his stuff is also all over amazon and target, and now my basement. EGN: Can I acroynm you? Is that okay? And maybe the best question is, why am I using acroynm as a verb? Regardless, Billy looks JUST LIKE YURTLE THE TURTLE. You’re so dead on. MizFit: Oh, Billy was the ishness. Yes, he had a massive following. I even had a friend who went as him for Halloween. It was a little awesome. Alex: Oh yea, exercise vids are way better than just watching TV. And honestly, some of them are even more entertaining than TV. And yes, Mrs. Davis probably doesn’t even remember me. Or Billy. Sad but true! Mrs Davis never asked for it back because she already had extra copies. Billy Blanks was everywhere then. I’m impressed he is still in that good of shape. I’d like to think if my job was working out I’d also be in pretty good shape too. 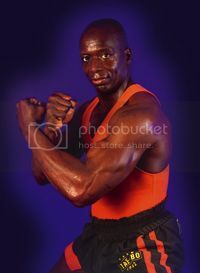 I’ve recently rediscovered my Billy Blanks tapes, and have been totally into getting back in shape! The old workouts are fantastic. My mom just gave me this new set of amped vids and I HATE them! )-: Maybe if I had the stick, that would help… But without it, this workout was a complete waste of time. What happened to doing so many reps you felt like falling over, and now do it double time?